11. End - or New Beginning? When reading the above passage we may get the impression that this is merely a casual reference to another brief visit to Galilee, such as Jesus had recently made. Or we may think that possibly there was some "unfinished business" in Galilee that needed Jesus' attention. Actually, however, we are here reading about a momentous decision on the part of Jesus, a decision which not only altered the course of His ministry, but also in all probability prolonged His activity for nearly two years. Moreover, because of this decision, we now have the record of some very important happenings, some outstanding teaching, and also some very practical lessons which are just as applicable today as they were at the time of Jesus' ministry. So let us look carefully at the situation here presented. Until this time Jesus had been conducting a teaching ministry in and around Jerusalem. In all probability Jesus taught regularly in the Temple courts, as did other teachers in those days. From time to time some of Jesus' listeners would ask for baptism; a baptismal service would be arranged, with the actual baptism taking place in one of the tributaries of the river Jordan, a little distance outside Jerusalem. These ceremonies would be similar to those held by John the Baptist, who was still conducting his ministry. However, it should be noted that Jesus deputized some of His disciples to perform the actual work of baptizing (see John 4:2). And it would seem that at this time the popularity of Jesus' teaching was increasing, for the candidates for His baptism were numbering more than those seeking baptism from John the Baptist. Why, then, did Jesus decide to leave this rapidly developing ministry in and around Jerusalem, and depart into Galilee? It is clear that this was no "snap decision," arising out of some trivial incident. There must have been some deep-seated causes for Jesus' action; and it is possible for us to trace some of these causes. (1) Scripture indicates that by this time the ministries of Jesus and John the Baptist had become (to use a modern word) competitive; and it is clear that such was contrary to the wishes of Jesus (see John 4:1). Furthermore, this competition was engendering controversy and ill-feeling; and Jesus had no desire that His followers should spend time quibbling over details. It may also have been that Jesus recognized that the time had come for a complete break with John the Baptist and his teachings—for, as Jesus put it, "No man putteth new wine into old wine-skins" (see Mark 2:18-22). (2) In seeking possible causes for Jesus' departure into Galilee, we should recall that shortly after this time John the Baptist was arrested, imprisoned, and put to death. John's political activities and denunciations aroused Herod's anger, and the Baptist's ministry was brought to an untimely end. May it be, therefore, that Jesus foresaw these happenings and sought to forestall the possibility of a second tragedy by carrying His ministry into a region beyond the jurisdiction of Herod? Such action should not be regarded as an indication that Jesus feared Herod, or any activity of Herod. Rather, the indication is that Jesus had planned an extended ministry, and was taking all necessary steps to insure its continuity and completion. So far from Jesus fearing death or imprisonment, He stated clearly: "No man taketh it [my life} away from me ... I have power to lay it down, and I have power to take it again" (John 10:18). It is well to note that after completing His Galilean activities, Jesus returned to Jerusalem to face far graver dangers than those arising from the displeasure of Herod. (3) Something which must have concerned Jesus deeply is indicated in the visit of Nicodemus (see John 3:1-21). Rereading this story, as it applies to our present discussion, we recognize that when Jesus was teaching in Jerusalem He was dealing mainly with people who were deeply entrenched in the old, traditional religious beliefs. The religious leaders in Jerusalem were quite satisfied with the teaching and interpretation they already had. While some of them acted in a patronizing manner toward this new Teacher, they had no intention of accepting the teaching He was presenting. Nicodemus' coming to Jesus "by night" indicated clearly the general attitude of the religious leaders. Jesus therefore decided to move to a more promising area, which, while not exactly virgin soil, might prove more open and receptive to His teachings. "Jesus came into Galilee, and the Galileans received Him. Spiritually interpreted, this means that the indwelling Christ reaches spiritual consummation ... in the measure that it manifests life and functions in Spirit consciousness" (Mysteries of John 52). Verse 4: "He must needs pass through Samaria." 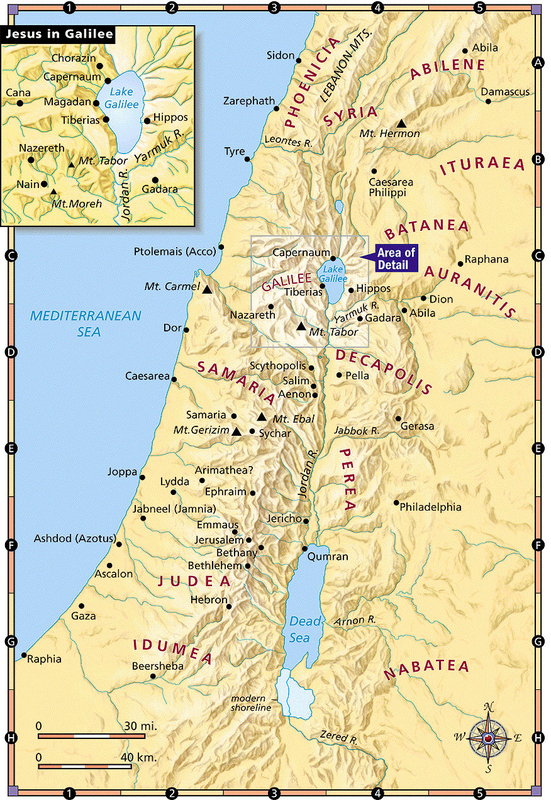 The Samaria of Jesus' time formed part of what was earlier known as the Northern Kingdom of Israel. This separate kingdom was set up following the death of King Solomon (see I Kings 12). 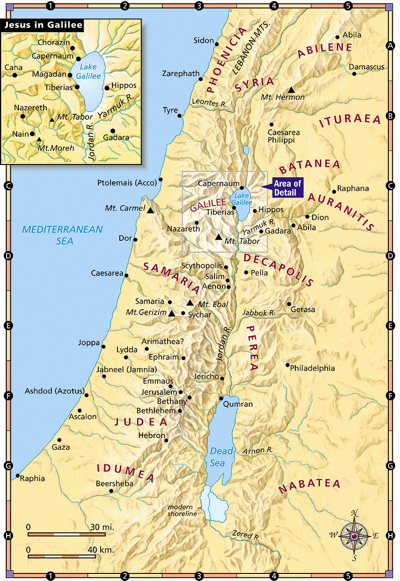 The city of Samaria was the capital of this northern kingdom, and later the name Samaria was also applied to the entire province. This northern kingdom of Israel was overthrown by the Assyrians in 722 B.C., and many of the Israelites were carried away to Assyria. Following this, the Assyrians sent groups of poor people from that country into the overthrown kingdom of Israel; and these, intermarrying with the remaining poor Israelites, produced the mixed race later known as Samaritans (see II Kings 17). The Samaritans claimed Abraham and Jacob as their ancestors. Also, while the Samaritans had their own forms of worship, they held to the laws of Moses, and regarded the Books of Moses (Genesis, Exodus, Leviticus, Numbers, and Deuteronomy) as their scriptures. However, they did not accept as scripture the Books of the Prophets, nor the later books now found in the Old Testament. In other words, the "religious clock" of the Samaritans stopped with the fall of Samaria in 722 B.C. On the other hand, the Judean Jews placed great emphasis upon the "pure blood" of their race, and they accepted as scripture not only "the Law," but also "the Prophets" and the "Holy Writings." Indeed, the Judean Jews regarded themselves as the "spiritual aristocracy," and they despised the Samaritans. Thus, when the writer of John's Gospel states that "He [Jesus] must needs pass through Samaria," this may have been in the nature of a rebuke against this race prejudice. In any case, there are indications in the New Testament that Jesus had a deep regard for these despised Samaritans. For example, note the parable of the Good Samaritan (Luke 10:25-37) and several other instances. Jesus also recognized the needs of the Samaritans; and although there is no record of an extended ministry in this area, His one visit made a great contribution, both to the Samaritans and to Christianity as a whole. Verse 6: "It was about the sixth hour." At the time of Jesus, the Jewish people reckoned the day as a period of twelve hours, starting at six o'clock in the morning and lasting until six o'clock in the evening. Thus, the "sixth hour" would indicate the period corresponding to our noontime. The question arises: Why would this woman come to the well to draw water during the hottest period of the day—at noon? Water was usually drawn during the cool period of early morning, or at sundown. Noontime, with the scorching sun overhead, would seem to be the most undesirable time to draw water! The explanation is to be found in the woman herself. Later in the chapter (verses 17-18) there are indications that the woman's morals were not of the highest order; and consequently she was often slighted or shunned by the other women of the village when they met at this water-drawing point. Hence, on this occasion, she had come to the well hoping that nobody would be around, and she would be spared the insults and cruel behavior of her neighbors. Her chagrin in finding somebody at the well is reflected in her reply to Jesus, when He asked her for a drink of water. Verse 24: Many translations read, "God is Spirit," rather than "God is a Spirit" (see A.S.V. margin). The reading "God is Spirit" is more satisfactory, since "a Spirit" might indicate the possibility of other Spirits—and this, we feel, would be far from the meaning of Jesus' words! However, the really important emphasis in this section is upon the idea of God's omnipresence. The worship of God is not to be limited to certain localities. Some persons may claim, "only in Jerusalem," while others declare, "only in Samaria," or some other place. But in the teaching of Jesus we are assured that wherever we are, or whatever may be the circumstances, we may contact God. The only requirement is that we must worship God "in spirit and truth"; and we are assured that "such doth the Father seek to be his worshippers." Reading this entire passage from a metaphysical viewpoint, we readily recognize the woman at the well as representing that deep-seated longing within human consciousness for something that will really satisfy. There are some things in life that offer temporary satisfaction; but these are not sufficient. When this temporary satisfaction is past, we still find ourselves thirsting, hungering, longing for something that will really meet our need. Jesus recognized all this when He said to the woman, "Every one that drinketh of this water shall thirst again" (John 4:13). We know from experience that one journey to the well is not sufficient. We find ourself going back there time after time; and even then, at the end of all our journeys, we still "thirst again." At first reading the above passages may appear to be in conflict with the account of the early followers of Jesus, as given in John 1:35-51. (Refer back to Lesson 2.) This account tells of six disciples coming to Jesus during the ministry of John the Baptist; while the synoptic accounts (given above) seem to indicate that Jesus called His disciples when He was opening up the Galilean ministry. However, the explanation may be found in the fact that Jesus, during His early Judean ministry, gathered around Him what we may term a preliminary group of disciples. At that time these disciples had not given up their regular occupations, but were closely attending upon the ministry of Jesus in and around Jerusalem. Later on, however, when Jesus began His Galilean ministry, He organized the group of twelve full-fledged disciples, which included the former six; and all the disciples then abandoned their former occupations, and devoted their whole time to becoming "fishers of men." At this point in our study, a twofold question presents itself, and calls for consideration: What was the purpose of Jesus in organizing this group of disciples? Why did He decide to make it a group of twelve? (1) A regularly organized group such as this would provide protection and companionship for the Teacher; and this was something very needful during the Galilean ministry. (2) This group would be regarded as what we might term "teachers in training." Not only did they hear all the general lessons given by Jesus, but He also gave them special instructions and explanations (see Mark 4:10-20). These disciples also took part in baptismal and similar services (see John 4:2), and they were later sent forth on special preaching missions (see Matt. 10). In a word, the disciples were organized to extend and continue the ministry of Jesus. (3) The number twelve would have special significance for the Jewish people of those times. Twelve would remind them of the twelve tribes of Israel, the component parts of the nation as a whole. This would also be an indication of the inclusiveness of Jesus' ministry, and would emphasize the fact that His purpose was to re-gather the "lost sheep of the house of Israel" (see Matt. 15:24). Then there would be the suggestion, in symbolic form, of the formation of the New Israel, or "the Kingdom," so often referred to by Jesus. (4) Going a step further, we may discern here a very important spiritual lesson—a pattern for us to follow, if we would develop our spiritual consciousness. The twelve disciples may be regarded as symbols of our twelve spiritual powers; and just as Jesus called, instructed, and sent forth His disciples, so we must deal likewise with our spiritual powers. What Jesus did, we also must do, if we would attain spiritual maturity. All this is fully discussed and explained in the book The Twelve Powers of Man, by Charles Fillmore. (5) At this time we should become familiar with two words used to designate this group of Jesus' followers. In New Testament usage they are sometimes called "disciples"; and this word indicates their position as students, or learners, in close fellowship with the Teacher. But in other instances they are referred to as "apostles"; and this word means "those sent forth," usually to accomplish some special mission. The New Testament makes it clear that the special mission of the apostles was to teach the people 4hey contacted about those things in which the apostles themselves had been instructed while they were disciples. Andrew (brother of Peter): Strength. James (son of Zebedee): Wisdom, or Discriminating Judgment. John (brother of James): Love. Thomas: Understanding, or Spiritual Illumination. James (The Less, son of Alphaeus): Divine Order. Simon (The Zealot, or Cananasan): Zeal, Enthusiasm. Judas Iscariot: Life powers as yet unredeemed. The above passage indicates that Jesus, in entering upon His Galilean ministry, made another visit to Cana, where some time earlier He had attended the wedding feast (John 2:1-11). The nobleman mentioned in this passage lived at Capernaum, some twenty miles distant, and he had a son who was seriously sick. Hence, the nobleman hastened to Cana, intending to bring Jesus back to Capernaum, so that the sick son might receive healing treatment. All this seems quite clear. But the conversation between Jesus and the nobleman, as here reported, needs careful consideration. Actually, the words of Jesus seem to be in the nature of a rebuke. Speaking to the nobleman, Jesus is reported to have said: "Except ye see signs and wonders, ye will in no wise believe" (John 4:48). But there is no indication in this passage that the nobleman had expressed any doubts regarding the power of Jesus. On the contrary, the nobleman's hurried journey from Capernaum to Cana might well be regarded as an indication of his wholehearted faith in Jesus' power to heal. It is quite possible that the nobleman had thought healing could come about only through a personal visit by Jesus to Capernaum, with the accompanying laying on of hands or repetition of some magical formula; but all this could scarcely be regarded as unbelief. First, we should recall that the conversation took place at Cana, and people there were still talking about the miracle that Jesus had performed at the wedding feast some time earlier. Therefore, when the nobleman arrived, he may have said to Jesus: "Please come quickly with me to Capernaum, and heal my son. Just as You performed a miracle here at the wedding feast, will You now perform another miracle for my suffering son? Please come with me right away!" However, Jesus recognized that Capernaum was many miles away, and much precious time would be consumed by the journey. Furthermore, the son's illness had now reached a critical stage, and delay might prove disastrous. Jesus thereupon said (in so many words) to the nobleman: "Can you believe without seeing signs and wonders? Or, in other words, have you faith enough to believe that your son can be healed without our journeying to Capernaum?" To which the nobleman might have replied, "Lord, I believe that all things are possible with Thee!" Jesus then said: "Go thy way; thy son liveth." And John records that "The man believed the word that Jesus spake unto him, and ... his son lived." Reading the story in this way, the details seem to fit together in an orderly pattern, and we are better able to understand the sequel, as given below. Cana: "Cana of Galilee [symbolizes} ... the power center in consciousness" (Metaphysical Bible Dictionary 138). Capernaum: "Capernaum (village of consolation, shelter of comfort, covering of compassion) refers to an inner conviction of the abiding compassion and restoring power of Being. When one enters this state of consciousness a healing virtue pours out of the soul and transforms all discord to harmony" (Metaphysical Bible Dictionary 139). "The light of Truth is shining more brightly today than ever before. The same faith that healed the nobleman's son will heal all persons who open their minds to it and let go of prejudice and unbelief. This fact is being demonstrated to all who are willing to believe. "Faith on the part of the patient or of someone connected with him is found to be an important factor in absent healing. This nobleman had faith that Jesus could heal his son, and when Jesus uttered the positive truth 'Go thy way; thy son liveth,' he 'believed the word' . . .
"When the word goes forth from a spiritual center (represented by Jesus and His apostles) it becomes a continuous life-giver to all who believe in the spiritual as the source of life. Through faith they 'tune in' and catch the message from the living word. 'The words that I have spoken unto you are spirit, and are life.' 'Heaven and earth shall pass away: but my words shall not pass away' " (Mysteries of John 54-55). Now for the sequel mentioned above: There is an old legend which tells how this nobleman, to show his gratitude for the healing of his son, placed his house at the disposal of Jesus, when the Master later came to Capernaum. The New Testament indicates that Jesus made Capernaum the central point in His Galilean ministry; and there are several references to Jesus' using a house such as that of the nobleman for His headquarters while operating in Capernaum and the surrounding territory. Gratitude was thus expressed, not only in word, but also by deed. Why did Jesus transfer His activities from Jerusalem to Galilee? (John 4:1-3) Indicate several possible reasons for this change of locale, giving Scripture references. Using your own words, briefly tell the story of Jesus and the woman at the well. (John 4:4-42) Be sure to include two important statements given by Jesus at this time. Briefly explain the statement, "For Jews have no dealings with Samaritans." (John 4:9) What was the attitude of Jesus in this regard? Why did Jesus gather around Him a group of twelve disciples? Suggest two or three practical reasons for this procedure. Explain briefly why, in our spiritual development, we leave "Judea" and go into "Galilee." What do these places represent in our consciousness? What does the woman at the well represent in our experience? (John 4:4-42) Explain why it is that after drinking of "this water" we "thirst again." Where is true satisfaction to be found? What do the twelve disciples represent in our consciousness? Give the metaphysical meaning of each name. Read carefully the story of the healing at Cana-Capernaum (John 4:46-54), and then: (a) explain how faith helped in this healing; (b) explain briefly what is indicated by the term "absent treatment."